The Liverbird spreads his wings as Liverpool are crowned champions in the 1900-1901 season. The answer to the question above on the picture is Sunderland, former team of Tom Watson, which came second in 1901 and went one better in 1902. On 1st April 1901 the Football League ruled that players' salaries be capped at 4 pounds a week and signing on fees limited to 10 pounds. Liverpool had offered better wages than most and suffered surely because of this ruling in regards to failing to attract top players, but the club still managed to keep all its key players. The club tried to get around the new ruling by giving the players other jobs at the club which they of course got extra money for. Alex Raisbeck, for example, worked as a bill inspector for the club, supposedly responsible for checking public notice boards advertising the club's matches. LiverpLiverpool struggled to follow up to their league success and finished 11th in the 1901-1902 season. What irritated Liverpool supporters to no end was that for the first time in a few years, Everton were considerably stronger in the league, grabbing second place, trailing by three points to Sunderland. 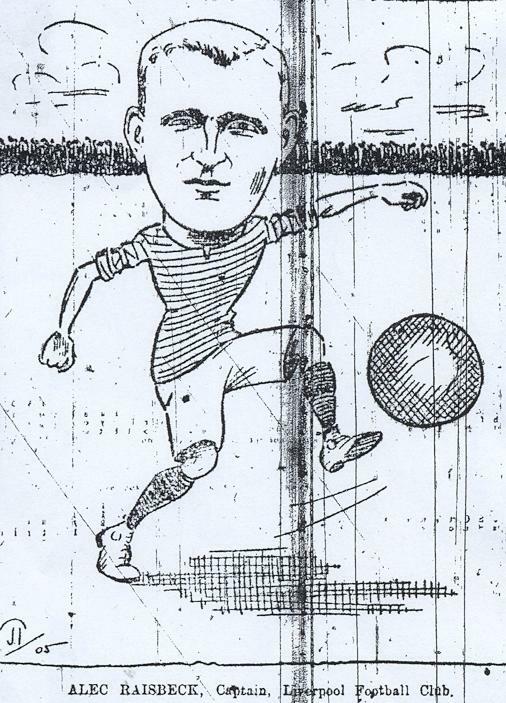 One notable individual achievement was Andy McGuigan’s feat of becoming the first Liverpool player to score five goals in the Football League in a 7-0 win against Stoke on 4th of January 1902. He later became a club director at Liverpool. John Miller had prior to McGuigan become Liverpool’s first ever player to net five in one game in the Lancashire league on 3rd of December 1892. A future legend was bought 24th of February 1902 from Glossop North End. Arthur Goddard was a regular scorer from his position on the wing for nearly a decade and a half at Liverpool, making 414 appearances and scoring 77 goals, thoroughly deserving his place in Liverpool's official Hall of Fame. 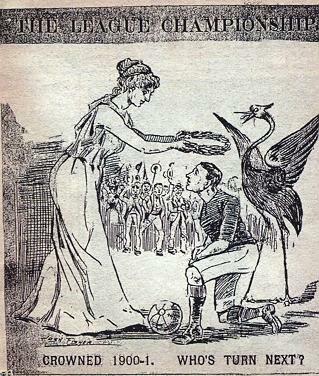 One event overshadowed Liverpool's 1901-1902 season. Hardly a year had passed since John Houlding saw his dream come finally true when Liverpool won the League title. Liverpool Football Club mourned the death of the club's founder and president who died at a hotel in Nice, France on 17th of March 1902. 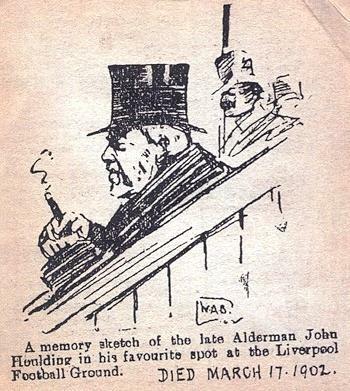 Houlding, who was born in 1832 in Liverpool, was Conservative councillor for Everton and Kirkdale from 1884 and on the extension of the city's boundaries in 1895 he was raised to the bench of aldermen. He was an Orangeman and Grand Master, second in Freemason seniority only to the King himself and Lord Mayor of Liverpool from 1897-98 where he served "in a way that was above criticism and gained for him much esteem." Houlding always had a keen interest in sports of various kinds. He had been the erstwhile Everton and latter day Liverpool bankroller, second President of The Anfield Bicycle Club and president of the English Baseball Association. 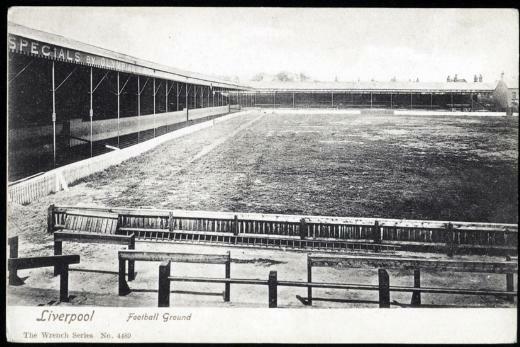 A photo of Anfield that dates from between 1903 and 1906 as the Anfield road enclosure was built in 1903 and the new main stand and terraced Kop from 1906 remain unbuilt. Liverpool needed a boost in the following season and it was provided by Sam Raybould who was absolutely on fire, scoring 32 goals in 34 appearances becoming Liverpool's first ever 30 goals a season striker and 1st division's top-scorer. Raybould scored four goals in a 9-2 win over Grimsby on 6th December and as Liverpool netted nine more conceding three in the next three games, a correspondent of The Penny Illustrated Paper and Illustrated Times commented that "I have a big idea of the powers of Liverpool; their forwards are a very smart line, and if Tom Watson's men don't bring their club bang in the front of the League before the end of the season I shall be more than surprised." Raybould's goalscoring exploits were however not enough for a top spot and Liverpool had to make do with being fifth with 38 points, four points behind champions The Wednesday, who won the title by one point on Aston Villa and Sunderland. Earliest footage available of a Merseyside derby that took place on 27th September 1902 at Goodison Park. This unique clip is courtesy of British Film Institute. What happened next season astounded the club’s fans. Liverpool completely collapsed in the league losing their opening five games. Liverpool suffered as Sam Raybould, John Glover and William Goldie were banned for seven months after accepting ‘financial inducements’ to move to Southern League’s Portsmouth! They were not allowed to play football until after 31st December 1903 and could never join Portsmouth. The Football League had since its inception in 1888 been based predominantly in the north and midlands. The Southern League was the dominant competition in Southern and Central England. Portsmouth tried to use lack of regulations of transfers between the leagues to their advantage but their approach was deemed as illegal. Liverpool had relied on Raybould’s goals, Goldie had been an ever present in the league the previous season in the middle of defence and left-back Glover had played 30 out of 34 league games. Liverpool slumped from 5th place to surprising relegation candidates. When the suspension was over Goldie joined Fulham in January 1904 where as Glover had already left Liverpool in October 1903 for 1st division Small Heath. Raybould was expected to save Liverpool from their slump on his return on 1st of January but he only scored 4 goals in 15 games. The Everton/Liverpool joint programme was sympathetic towards Raybould. “Only one man in a thousand can rise to the height asked of Raybould. It was assumed that when he returned goals would come and victory follow as a natural sequence. They didn’t and of course the centre was blamed).” Since the number of teams in the 1st division had been increased to 18 a few years before, the two bottom teams were automatically relegated. The Reds only won 9 games compared to 17 the year before and finished second from bottom. Liverpool were back in the 2nd division three years after winning the League! Liverpool's defence with Raisbeck in the centre was also in capital form, only conceding 28 goals in 36 games with Sunderland's legendary goalkeeper Ned Doig in excellent form, keeping 16 clean sheets. Doig had teamed up with his old boss, Tom Watson, in the summer and became the oldest debutant in Liverpool's history when featuring against Burton United on 1st September, two months shy of his 38th birthday! Doig was an ever-present in the season and highly praised for his performances: "The defence of the Livers away from home has been wonderful. This speaks well for Doig whose advent into the team was a master stroke. The veteran has displayed all his old ability, and although he has seen so many years service he is as agile and clever as ever. 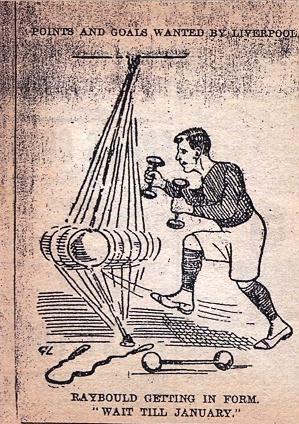 To have such a player between the posts must give those in front of him every confidence, and if he keeps fit and well there is no doubt but that at the end of the season it will not be his fault if the team does not go top" (Club programme from 12th November 1904). Liverpool, Bolton and Manchester United were in a class of their own in the 2nd division. Liverpool drew Bolton 1-1 at Anfield with 6 games to go and then brushed aside Manchester United 4-0 at home in the penultimate game of the season, winning the league two points ahead of Bolton. 1st division football would be at Anfield next season. Reporters at the Liverpool Echo were clearly optimistic for the battle ahead in 1st division in the 1905-6 season. "The Anfielders have trained loyally and well during the past few weeks, and at the present time they could not be in finer fettle or condition. As will be seen "the old brigade" of last season are being relied upon to do the battle for the honour of Liverpool, and if the form that lifted them from second-class company can only be maintained they should occupy a high place in the League ladder before the winter is over." Liverpool's form relied heavily on the performances of several key figures and Alex Raisbeck was the lynchpin in defence: "Ten years have passed since the Liverpool Club fought its way into First League circles, and during this period, Alec Raisbeck has commanded his forces with wisdom and energy. A player of amazing vitality and strong personality, he has won many games by his individual efforts. His early training was among Scottish cracks, and the highest honours have been his. It is very largely down to his individual efforts that the Liverpool team has returned to the First Division."